"Won't some great heroes come to save us?" Rainbow Brite is a blast from the past for any child of the 80s. The character was seemingly lost among Transformers, Barbie, He-Man and a slew of others, but the Hallmark property still managed to garner a fervent following. That following is renewed with Rainbow Brite #1 from Dynamite Comics. The issue is written by Jeremy Whitley, illustrated by Brittney Williams, colored by Valentina Pinto and lettered by Taylor Esposito. The adventure begins for children and adults alike, as the classic character Rainbow Brite comes to comics and brings a little color to your life! Wisp and Willow are best friends who live in a small town. They are inseparable, until one night Wisp discovers something is stealing the color from the world! To escape their grasp, Wisp must use her wits and the help of a new friend...from somewhere else! Then the adventure begins! Whitley has a remarkable knack for taking something primarily aimed at kids and making it accessible for even adults--something that shows no signs of abating in Rainbow Brite #1. Whitley's script in the first issue is extraordinarily succinct in its delivery as it attempts to inform new readers about the Rainbow Brite mythos in general. The reader is introduced to Wisp and Willow, two main characters who ooze innocent charm and serve perfectly as points of view for the story. The first issue also stays fairly faithful to the original Rainbow Brite stories and the presence of the King of Shadows' minions serves the issue (and series) well in establishing what's at stake. Whitley ends the issue with a great cliffhanger that definitely captures the imagination of the reader, as it thrusts Wisp into a completely unknown world that both she and the reader will need to explore. Williams uses an art style that feels like a happy mix between Saturday morning cartoon and Sunday morning newspaper comic strip. The characters are illustrated with somewhat thick, black lines that clearly define them against the relatively sparsely illustrated backgrounds. Most of the pages present the panels in a fairly clean format with Williams occasionally working in some slightly askew layouts in addition to some insets and overlays. Characters are extremely emotive throughout the issue with Williams affording them very detailed facial expressions that are expressive and engaging. Pinto's colors are bright and bold, shining especially so by the end of the issue when readers get a glimpse of Rainbow Land. For all intents and purposes, Rainbow Brite #1 is an origin story and one that works exceptionally well. Wisp is poised to be an unlikely hero for a desperate kingdom, but the road to that responsibility certainly won't be easy. Whitley's script feels charming and sufficiently saccharine, oozing a sense of effervescence. Williams' illustrations are airy and light in a way that infuses the issue with the right amount of bubblegum appearance. Rainbow Brite #1 is a very easy read that's still thoroughly engaging and a treat for readers of all ages. 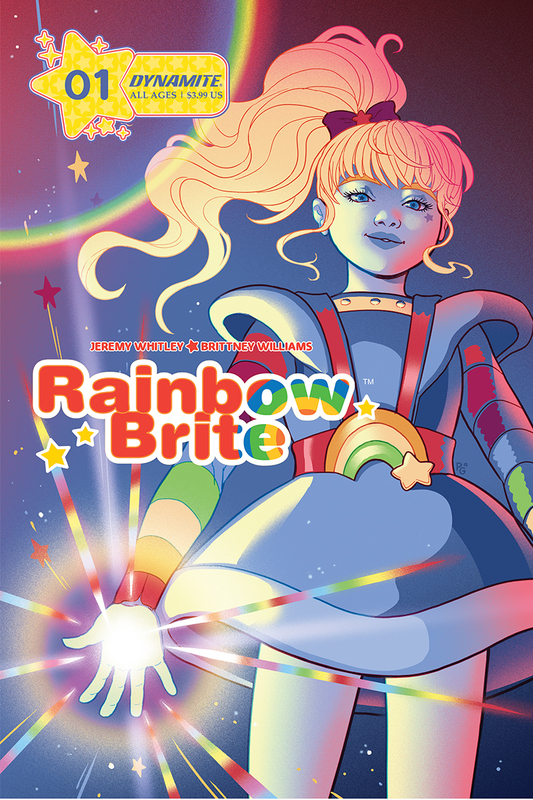 Rainbow Brite #1 is available October 3.